A blog and The Life In Between : Engagement Party. Long time planned && coming our engagement party came out to be successful ! - thanks to family and our amazing friends to making it such a fun and memorable weekend for all. If you want to see some photos everyone is sharing of our special journey you can find it on IG by looking up our #KDownTheIsle. Nothing about this journey so far has been ordinary haha - from the destination engagement to geting a house to celebrate it annddd all the way to planning a destination wedding! Yes...you can only imagine how crazy our lives have been for the past few months. When we were planning our engagement party we did look into and considered quite a few venues but came across many bumps along the road. Many venues are as you might know way over priced for any wedding related event you may want to have, not to mention you can only rent it out for up to 7 or so hours. 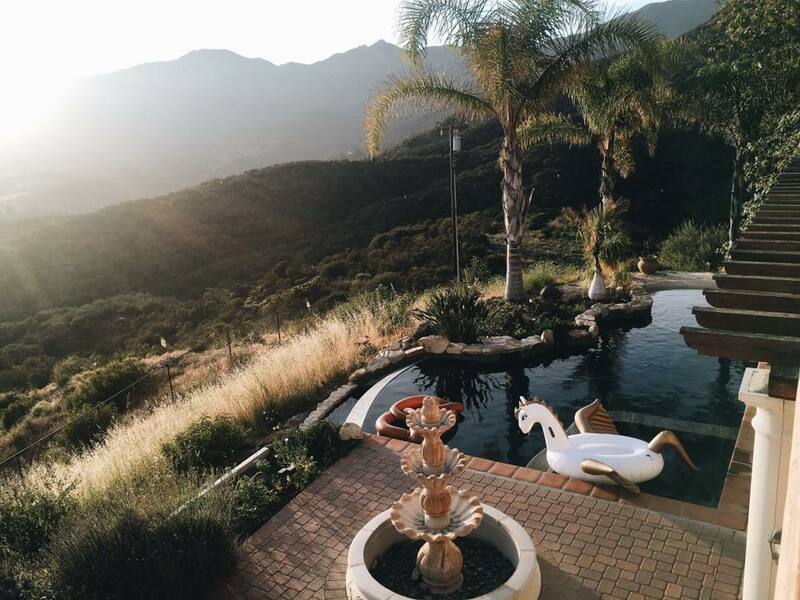 After many calls and scrolling down through pages and pages of venues we decided to get a house in Malibu for the entire weekend and throw a party for all of our friends to celebrate our love! Of course having the venue and nothing to worry about sounds like the way to go but planing it and creating decor yourself just makes the event that much more exciting and special - not only for yourself but for your friends as well. Another great reason to rent out a house is to let your friends that come from other sides of the world stay over and not worry them about geting a hotel! The day of the engagement party turned out beautiful even though the weather had me worried a little. Those of you following me on snapchat (@skynaitee) - sorry for blowing up your feed with many snaps! Custom wine stickers can be ordered on Amazon & Easy. Great idea for any decor for your party! ...Because no party is complete without donuts! I had way too much fun with these little jars ! They were not only great for small drinks/shot but might be reused for future events such as baby shower - of course different captions haha! Thanks to my amazing mom for making these beautiful floral arrangements. We placed our # on every table, that way guests can get used to it and remember it during the wedding to make it easier for everyone to track photos taken during the big day. pretty little things. Stirs for drinks can be purchased on Amazon. I love the wine stickers you've got but all in all I had fun reading this. It feels like I was part of that party.